It’s that time of the week when my wife and I try to get the kids to help get the house in order, so that we can relax and play some D&D. As usual, this is always more challenging than we anticipate, but we succeeded and sat down around the table. 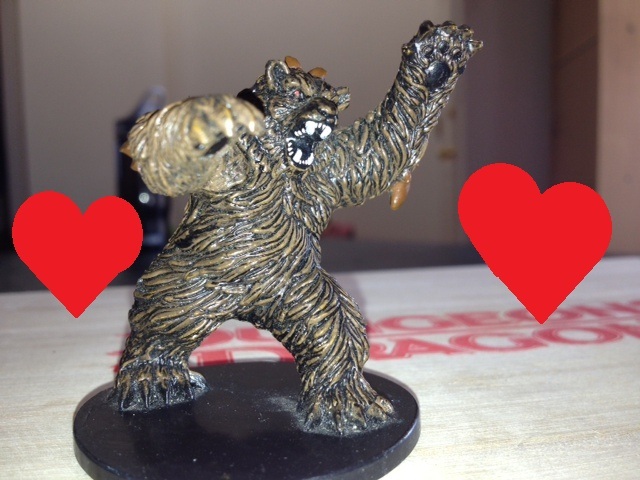 And Judah escapes with a Dire Bear miniature that apparently he now loves. He flips out when we try to take his new teddy bear, and immediately calms down once we return it to him. He doesn’t put it in his mouth, it’s too big to swallow, it doesn’t have any small parts, and we’ve got an eye on him. So he hangs onto the bear for a minute. I laugh. He’s always been the one who wants to help DM. One of these days, I’m going to have to let him. But for now, it’s just a bunch of goblins. The heroes bust through the gate of the goblin-occupied town and begin the assault to return it to the townsfolk. Deborah’s character, the acrobatic Beastly Tiger rushes to the first house and tries to spring up and pull himself onto the roof to engage the goblin archer up there. 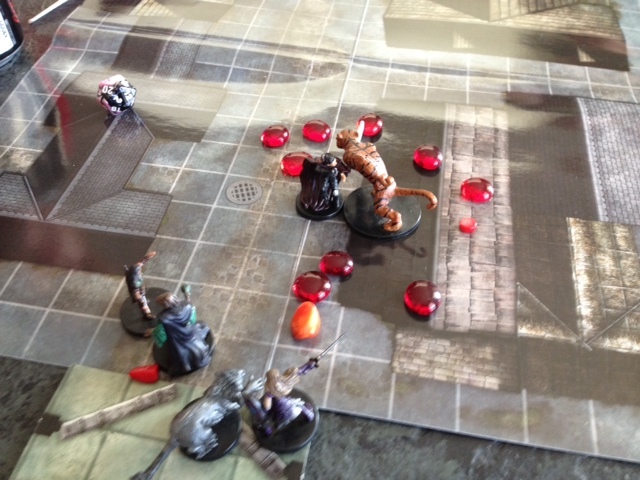 Deb rolls a 1, and I tell her she hit the overhanging rooftop with her head. Jonathan’s wizard, Killbot creates a massive ball of fire that he moves around in order to burn his enemies. Justin tries to shoot through it at a goblin mage, and Jonathan and Jami both start asking if shooting through the flaming sphere will light the bolt on fire give any bonus to the attack. I want to encourage this kind of creativity, so YES. Yes of course it does. I think Jonathan has been playing too much Plants Vs. Zombies and was thinking of the Torchwood. Beastly Tiger gets up on the roof and smashes his foe with that massive hammer. It’s a one-shot kill, and Deborah is satisfied at having gotten past that initial fumble roll. Unfortunately for my monsters, that’s how I rolled tonight. Math completed. The goblin is consumed in the flames. Justin’s character, Clayface has a crossbow, the special item card he got from the NPC challenge last session. The card describes a stock carved and stylized to look like a dragon, with the bolt flying out of the dragon’s maw. So I figure this has some flame power that the characters haven’t identified yet, but I haven’t decided exactly what, other than a +1 to damage. He attacks a goblin and kills it, and I decide that the magic power is that if a bolt from the crossbow kills a target, the bolt explodes and damages anyone next to the target. No one is around the goblin that Clayface kills, but I describe this nonetheless and the children decide that’s pretty cool. Sure enough, my plans come back to bite me later. Toward the end of the fight, three goblins remain. Justin shoots one and kills it. And of course it’s next to one of the other remaining goblins. Faithful to my word, the dead goblin explodes, and I roll an attack against the other goblin. I roll a 20 against my own monster. We’re using the Critical Hit deck, so I pick a card. The goblin is deafened by the explosion and takes double the damage I’d originally planned. He’s barely hanging on to life and his ears are ringing. Now it’s my half-orc sorceror’s turn. As always, I try to leave him in the background. He’s there for comic relief or as a handy tool for explaining a concept by example if needed. So he casts a basic spell on the mostly-dead goblin, because certainly he can’t steal the spotlight with that. 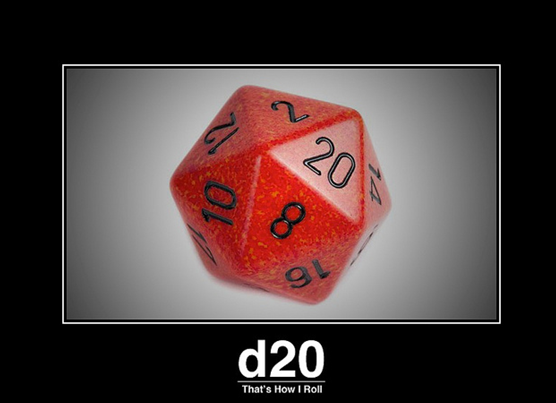 I roll a 20 again. The kids cackle with glee, knowing something horrible has happened to this goblin. Double damage and knockback of 5 squares (25 feet). This guy would’ve been killed instantly by the spell if he was fine, but he was already down to almost no health. That and the knockback meant “explosion” in my mind. I describe the devastation, and I lay out some gobs of meat–little red rocks I use to mark “bloodied” when a PC or monster has lost half its health. Well played, Beastly Tiger… touché.